Tom Morris left us a legacy of wonderful boats with timeless styling. I think you can accurately credit the M36 with kicking off the current interest in daysailers. These S&S boats have style and dignity and to my eye define the term "yacht." The new 29 will take its place alongside the M36, M42 and M52, all S&S designs. I can't help note the contrast between this new Morris and the Baltic 45. Kind of makes you wonder about the definition of "daysailer." The M29 has moderate proportions. The D/L is 258 and while that may sound on the heavy side it is more a reflection of the short DWL than its overall weight. The M29 has more than 8 feet of total overhang. It's the fore and aft overhangs that give the boat that classic look. The boat would be faster with far less overhang but a boat like this is as a much of a style statement as it is a sailing machine. Note the generous camber to the transom and the subtle sheer spring. The sheer looks a bit flat on the profile but keep in mind that this boat has an L/B of 3.94. It's a narrow boat and narrow boats need less sheer spring to look right. There is a hint of hollow or reverse in the profile of the stern counter. Standard draft is only 4 feet, 6 inches with a moderate-aspect-ratio fin with a bulbish tip. The rudder is carbon fiber on a carbon stock. There is not much interior to this boat. It's a narrow boat and the emphasis has been placed on having a large cockpit. Daysailing is all about the cockpit. Below there are settee berths port and starboard. There is a porta potty directly ahead of the engine box. The fo'c'sle is huge and I would suspect you could squeeze another two berths up there if you really wanted them. I'd like to see a place for a minimal galley but I'm sure the Morris yard could arrange that for me. The rig is ultra simple. The mast is carbon. The single spreaders are swept 18 degrees. The backstay just kisses the roach of the mainsail. The jib is self-tacking and the jib furler is located below the deck. The jib tack is about 30 inches aft of the stem. 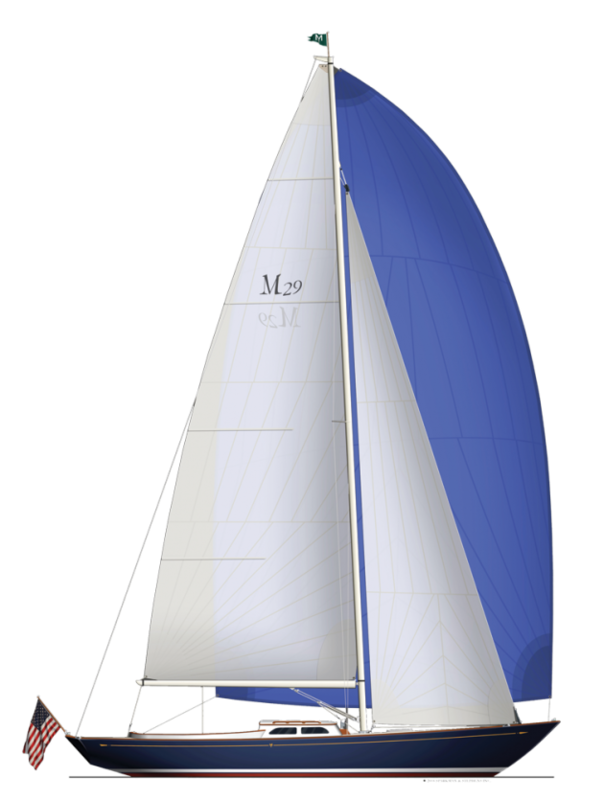 This, along with the bow overhang, allows an asymmetrical chute to be flown clear of the headstay without the use of a prod. The SA/D is 19.8, almost half of what the Baltic 45 is. But you can probably sail the 29 all summer without having to reef the mainsail. Not having to reef is good. I suspect an afternoon's sail on the 29 will be a somewhat more calm experience than the same sail on that big Baltic. "Damn! My beer is warm." If the wind dies you can fire up the 14-horsepower Yanmar and that saildrive will push you along nicely at about 6 knots. One way to enjoy sailing more is to have a simple boat that you can get underway quickly and put to bed quickly. Crawling around by yourself trying to fold a genoa is not much fun and the modern fractional rig makes a genoa obsolete anyway. The mainsail could be easily rigged with simple lazy jacks. You drop the halyard, go forward and punch and pull the sail into a reasonable "flake," put the sail cover on and you are done. Hose the boat down and you are gone. I like small boats. This new Morris would look good on anyone's mooring. LOA 28'11"; LWL 20'10"; Beam 7'4"; Draft 4'6"; Displacement 5,230 lbs. ; Ballast 1,958 lbs. ; Sail area 372 sq. ft.; SA/D 19.8; D/L 258; L/B 3.94; Auxiliary Yanmar 14-hp; Fuel 8 gals. Morris Yachts, 53 Granville Rd., Bass Harbor, ME 04653, (207) 244-5509, www.morrisyachts.com.